Ha, ha! You’re reading an article “for dummies”. (Did we mention that the first step to recovery is admitting you have a problem?) Surely we jest… all kidding aside, unless you work in the construction industry or watch HGTV 24/7, you’re not supposed to be an expert on this topic, as you may only do this a couple times in your entire life. Since we do it a little more often than that, allow us to offer some helpful advice so that when the time comes for you to update a bathroom, you’ve got some of the basics down. Plumbing is Expensive to Move: Yes, there are times when it makes sense to change the layout of the plumbing in a bathroom. However, moving it will add to both the duration and costs of your project. This is one area where change doesn’t need to be made for the sake of making change. Now is the Time to Amplify Natural Light: Many bathrooms are in areas of the home that do not have windows which means poor lighting and air circulation. Remedy this situation by adding a sun tunnel or skylights to your bathroom. Companies such as VELUX even offer battery powered skylights that have rain sensors that automatically close the unit upon detection of rain. You are on the Supplier’s Timeframe, Not the Other Way Around: When ordering custom items such as tiles, vanities, light fixtures, bathtubs, etc., the supplier, not the homeowner, dictates the time frame the items will be available. To keep your project moving as quickly as possible, select these items at the very start of the project and do not start the demo process until the arrival date (or thereafter) in order to not have a bathroom that’s a construction zone for several weeks. Consider a Walk-In Shower: If you’re looking to replace your current shower, a walk-in shower may be worth considering. Eliminating the step up can make the room appear larger. It’s also worth considering for homeowners who plan to retire in their current home. It’s Okay to Wave the White Flag: If any part of the project makes you uncomfortable, there’s nothing wrong with calling a professional. Yes, it can be an added expense, but then again, so can having your home flood because a water supply line was severed during a project you attempted to do yourself. Beware of Trends: Ever been in a bathroom that still has an avocado green toilet? Looks out of place, doesn’t it? Opt for trendy items that can be swapped out easily such as rugs, shower curtains, toothbrush holders, etc. and keep your toilet and bathtub in traditional hues. 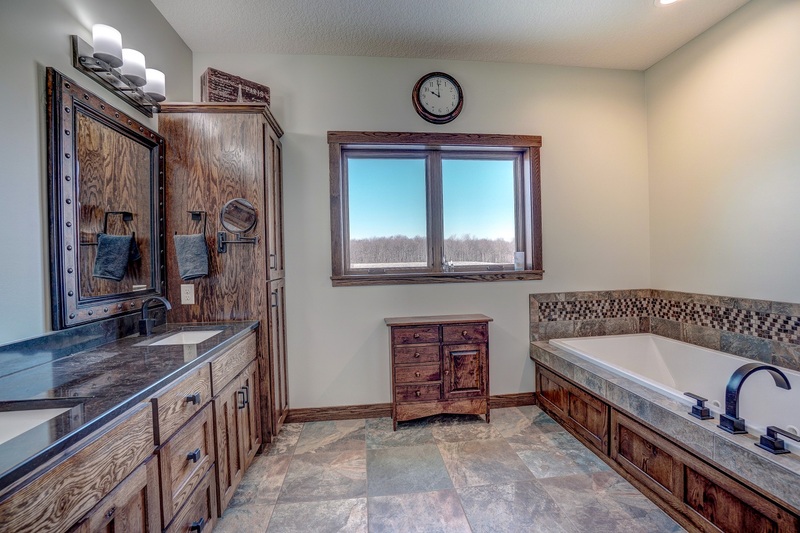 Interested in a Bathroom Renovation Estimate? Click Here. These homeowners had a wish list that included updates to a master bathroom, dressing room, and staircase. The kitchen is beautiful. Exactly what I wanted. You and and your team are remarkable!" - Jody G.